When it occurs, osteonecrosis of the jaw can be devastating. Our brochure helps patients make informed choices. 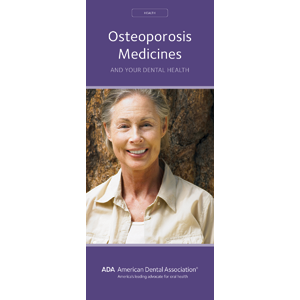 Includes a list of osteoporosis medications and discusses their valuable effect on reducing bone breaks, much more common than ONJ. Advises patients not to discontinue osteoporosis meds without consulting their physician. 6 panels. Minimum order 150. Click Add to Cart then personalize for free. Now you can add personalized information on the front, back, or both covers on all brochures.